A storm can be a homeowner’s worst nightmare. When hail starts falling, you can only stand by and watch as Mother Nature takes her toll. While you feel blessed as the hail bounces off your roof, protecting you and all you own, when the banging stops, you worry about the damage caused. Mother Nature is just one common cause of roof damage. Top Source Contracting is Dallas-Fort Worth’s Top Rated Local® roofing contractors who offers both residential roof repair and commercial roof repair, as well as roof replacements when your home or business is damaged. If you suspect roof damage after a storm hits or at any other time, give us a call for a free roofing inspection today! Weather. Weather causes all man-made materials to break down. Wind, rain, hail, snow, and the sun are all leading causes of roof damage. Hail can crack shingles, leading to holes or cracks that cause leaking roofs. Snow can cause snow dams, leading to pooling water that can seep into your attic. Rain can collect as well and sit, or find a small hole to infiltrate. UV rays from the sun can cause the top protective layer of asphalt shingles to dry up, warping and cracking them with. Weather can shorten the longevity of your roof or necessitate a roof repair. Trees. Trees are beautiful to behold and useful for shade during the summer and protection from the wind. However, tree branches or trees themselves often fall on homes or businesses during heavy torrential rains, wind storms, or snow storms. Additionally, the fall, while full of splashes of vibrant colors, also creates debris build-up on your roof and in your gutters, with pine needles, pine cones, leaves, and twigs. It’s important to remove this as well from your roof and gutters as soon as possible to prevent algae growth and sagging roofs or gutters. Wildlife. Birds chirp from your rooftop and squirrels scutter on your roof in their journeys from one tree branch to another. While nature is wonderful in its variety and amazing to behold, these little critters have minds of their own that have one main thing on their minds — survival. If survival means making a nest in your attic to raise its babies, animals don’t think twice. If a raccoon waddles by, looking for a place to birth its babies and it notices a tiny hole under your eaves, it has no problem widening this hole and nesting in your roof. Mice, rats, bats, and even feral cats will make homes in your roof, costing you thousands of dollars in roof repairs. Faulty gutters. Gutters are possibly the unsung heroes of your entire roofing system. They are responsible for removing the biggest cause of roof damage (water) from your roof. They guide the water safely away, protecting your home’s foundation and outdoor landscaping as well. Most people never think about their gutters until they do begin to falter. When gutters don’t work or are clogged, water can build up on your roof, leading to rotting wood and leaking roofs. Neglect. Any material made by humans needs upkeep, whether it’s your car, your computer, or your roof. The worst thing you can do is spend money on a brand new roofing installation, and then not do anything until you notice a problem. You will shorten your roof’s lifespan, durability when a storm hits, and likely have a major repair issue on your hands when a sign of roof damage does appear. The best way to mitigate roof damage against the weather is through regular roof inspections and roof maintenance. You can’t stop Mother Nature from doing her thing. You can stop tiny holes from expanding to become big holes and replace shingles as they are damaged. Preventative measures, much like preventative healthcare, stops small things from becoming big (and more expensive) problems to fix. Keep trees trimmed. This is the easiest way to prevent damage to your roof from trees. Cut down any old, decaying, or dying trees, as well as any individual branches on viable trees to prevent them from falling on your home or business. Close off any holes. Animals are notorious opportunists (like humans) who will take advantage of a tiny opening in your roof. If you think about it, roofs make great homes for animals. They protect against the elements, are warm, and offer plenty of insulation to make nests with. They are hard to get to for predators, dark, affording lots of hiding places, and are perfect hideaways. Have your roof inspected by a top-notch roofing company such as Top Source Contracting in Dallas-Fort Worth. He or she can determine if you have any critters in your roof or attic and take measures to remove them. Exclusion doors are the most humane way to rid your roof of uninvited guests. Exclusion doors allow the animal(s) to leave but not re-enter. That way, you can wait for all of them to exit of their own accord, and then have your local roofing company seal and repair the holes left behind. For mice and rats, wooden snap traps or bait traps work best to remove the rodents. One caveat: If you suspect bats are living in your roof, you’ll have to call in a professional animal control who specializes in removing bats. Most bats are protected species, and it can be illegal to have them removed (by no means are you allowed to kill them). Better to be safe rather than sorry and face still fines from the Department of Wildlife. Clean your gutters regularly. You’ll want to schedule gutter cleaning annually, which for most people is in the fall when leaves and debris clutter your gutters. Gutters are usually fastened to the home; however, if your gutters weren’t installed correctly in the first place, or they are showing signs of wear and tear, they can cause roof damage. 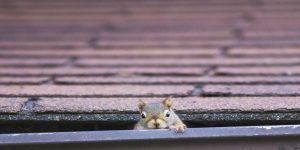 Critters can damage gutters as well by climbing up and down them. If you notice water pouring out over the side and not draining properly from your gutters, odds are you have a clog. Call your local roofing contractor, Top Source Contracting in Dallas-Fort Worth, for a free gutter inspection. Similar to mitigating against the weather, you’ll need to give your roof a little love and attention at least once a year. Walk around your home after any major storms, looking for granules or shingles lying in the yard or blown off your roof, fix any noticeable holes, and call your local roof inspector, Top Source Contracting, to ensure your roof is in tip-top shape. Top Source Contracting is the best roofing contractor in the Dallas-Fort Worth area. Our mission is to help you maintain your roof, so it’ll last for years to come. We offer both residential and commercial roof repair and roof replacement services. We’ll inspect your roof, draw up an estimate, and get to work fixing your roof, so you won’t have to worry. We’re honest and attentive to details. We don’t cut corners, and we leave you with the best roof installation around. Top Source Contracting has insurance specialists ready to help you with your insurance claim in the event when Mother Nature strikes. Instead of you being the go-between between your roofing contractor (Top Source Contracting) and your insurance company, let us handle your insurance claim for you. We can answer the questions they have about your roof damage and work hard to get your roof damage covered. If you can’t remember the last time you had your roof inspected, or you just want peace of mind that your residential or commercial roof is in tip-top shape, give us a call for your free roofing estimate today! Do You Have A Roofing or Construction Project We Can Help With? ©2019 Top Source Contracting - All rights reserved.